The agreement that a tenant and landlord enter into states all the obligations and responsibilities each party has to comply or provide in order to foster a positive and harmonious relationship. One of the responsibilities of both parties is providing an appropriate notice when there are changes in the property or tenancy. 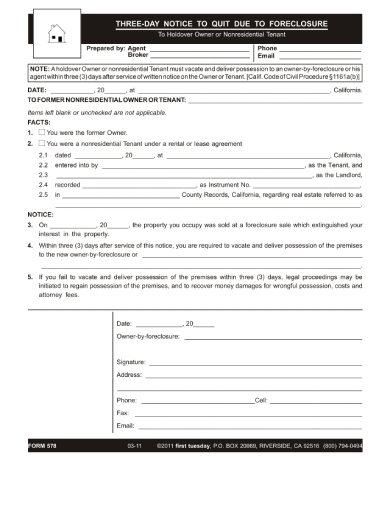 A notice to vacate or notice of intent to vacate should be given when the tenant should or wants to move out from the property due to various reasons. Providing a notice prepares both parties for the appropriate action to take regarding its contents. As a landlord, it is your responsibility to inform your tenant of the decision to have the place vacated. In some states, it is illegal to just kick out a tenant without prior notice regardless of the seriousness of the violations. 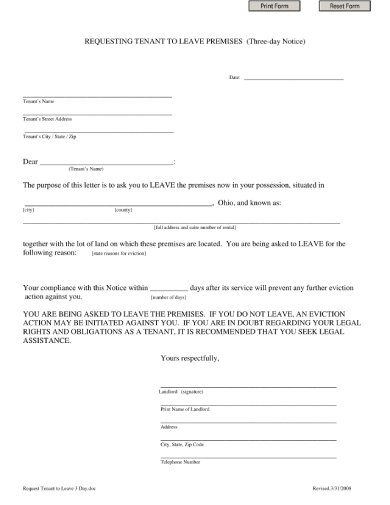 In that regard, you should send a 3-day notice to leave premises to the tenant after you have sent a prior notice. Looking at this example, you can see how clear the layout of the notice is and how direct the message was conveyed. Sometimes, there are tenants that make it a habit to forget to pay the rent on time. Although most landlords would understand especially when things are explained properly, others simply do not. If a tenant has continuously violated the rule regarding rent payment, you can write and send a notice to pay rent or vacate to give them three days to comply or amend their violation; however, a 3-day notice can only be given when a previous notice has already been sent. 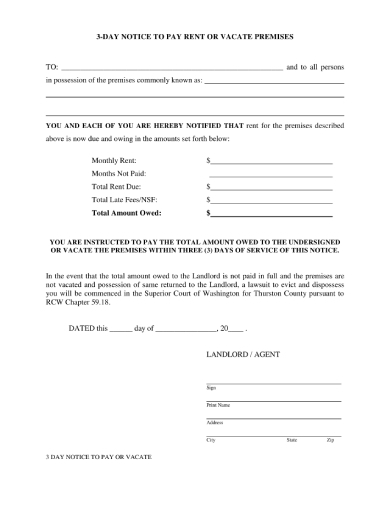 The rental agreement or lease agreement that has been signed states the terms and conditions that the tenant has to adhere to during his or tenancy. 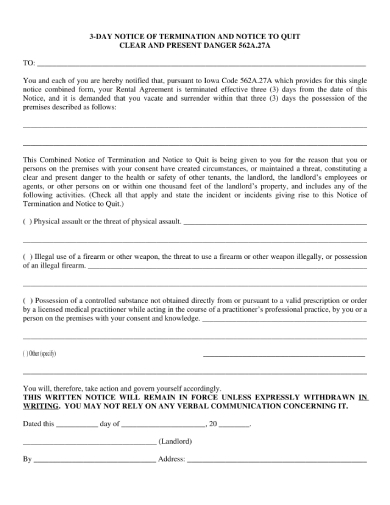 Violations that have been committed for countless of times, depending on what is stated in the agreement, can be grounds for eviction. If that is the case for you, you can send a 3-day notice to leave for nuisance to your tenant if he or she has been reported several times for nuisance issues. A 3-day notice to pay rent or vacate premises can be given to a tenant who has failed to comply or amend his or her unpaid rent. Given that you have given the right number of days to fix the violation on the previous notice, issuing a 3-day notice is a good way to give the tenant one last chance. If you are having trouble on how to write this notice clearly and properly, you can download this example and use it as your reference. 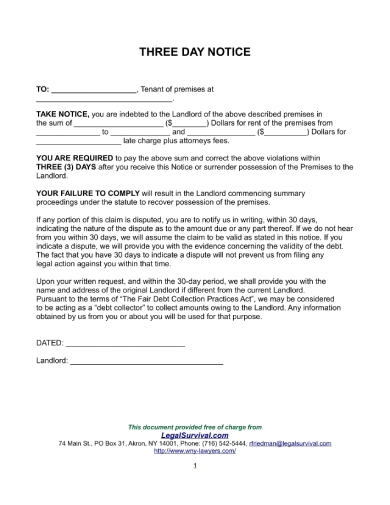 In NYC, it is required by law that a landlord give tenants a written 3-day notice to inform him or her that he/she has three days to pay for his or her unpaid rent; otherwise, the eviction process will begin. 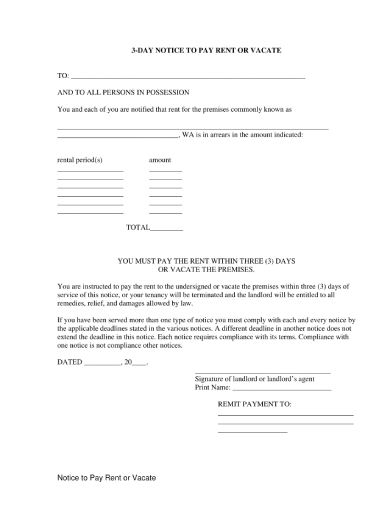 This notice will tell the tenant that he or she only has three days to either pay rent in full or move out of the rental unit. In this notice example, you can see how the message was directly conveyed and the notice has a clear layout and format to help tenants easily understand it. When a tenant violates the provision on the agreement that states the amount for the rent and payment schedule, it is only right to give him or her a notice reminding him/her of his or her financial obligations. In relation to this, you can give a 3-day notice to comply with the previous notice or vacate the premises; once he or she still fails to do so, you can immediately send an eviction notice. You can download this example and use it as a guide when you start to create your own notice. 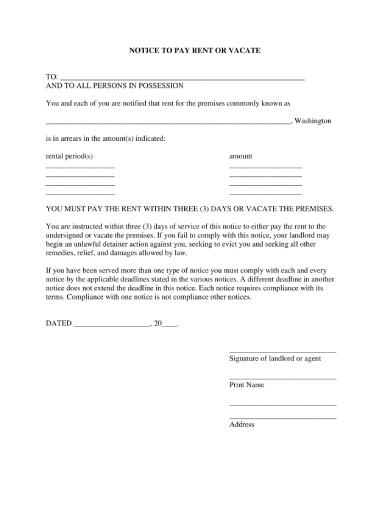 Similar to the previous example, this notice can be sent to the tenant to let him or her know he/she only has three days to either pay his or her unpaid rent or vacate the rented unit. As you can see, this notice is well formatted and clearly conveys its purpose. It is important to include the pertinent details of the tenant such as his or her complete name, unit number, and address; the unsettled rent amount and the date for eviction should also be included. 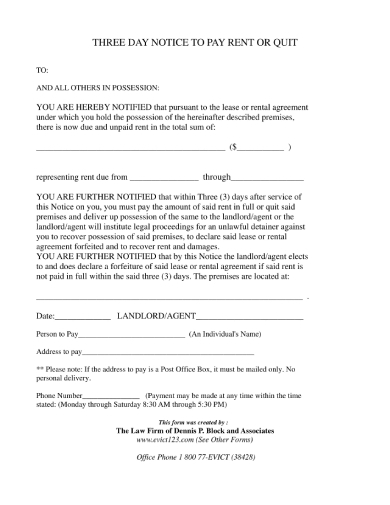 Aside from tenant violations, a notice to vacate can be given to the tenant if the property is up for foreclosure. 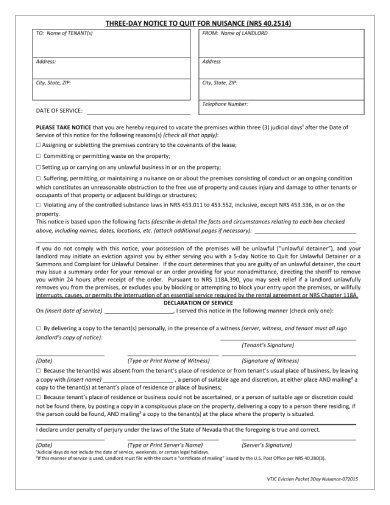 As you can see in this example, it has a fillable form format which makes it easier for the landlord to fill it out with the necessary details relating to the tenant, reason for eviction and eviction date. 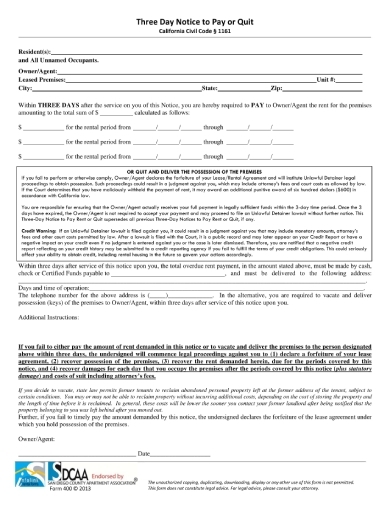 Having a form ready for circumstances that may require you to kick out tenants will surely make the process easier and more efficient for you. Unpaid rent is the most common reason why a tenant is evicted from a rented property. However, landlords cannot immediately kick the tenant out from the premises since it is mandated by the law that a notice to pay unpaid rent should be sent to the tenant first. Sending a 3-day notice after a tenant has failed to comply to the previous notices will help inform him or her that he/she is only given three days to comply or else he/she will be evicted from the premises. The tenancy can only be terminated if a notice to vacate is given. Thus, to avoid legal repercussions you should give your tenant a notice to inform him or her that you intend to have the premises vacated within a specific date and that his or her tenancy will be terminated on the same date. If the tenant fails to comply, you should give him the same notice but should only limit him or to three days to comply; hence, a 3-day notice. Give your tenant a three-day ultimatum to either pay his or her rent or quit the tenancy through the use a 3-day notice. The notice should state the basis for such a decision to help him/her understand that the issue has been recurring and will no longer be tolerated. 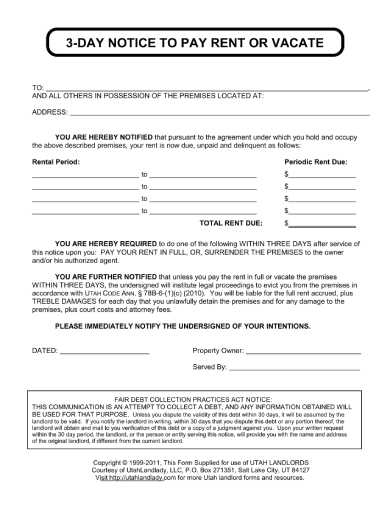 You can use this notice example as your guide to ensure that you create a clear and comprehensive notice to your tenant.